The creators of 80 Days describe their next game and the consequences of digging up the past. 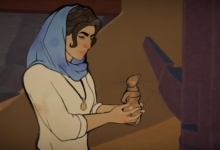 There is a moment in Heaven’s Vault, the new adventure game from the makers of 80 Days, when I suddenly felt the weight of history press down on top of me. I had just opened up the Timeline tool — which helps you track all the decisions you make throughout the game. I hadn’t been playing for long, so I only had a few minutes’ worth of logs. But then I zoomed out and the events of my protagonist’s recent backstory came into view. I kept zooming. Her childhood appeared; then her birth; then even that shrank into a tiny pinpoint as the timeline extended back 1,000, 5,000, 10,000 years. Empires rose and fell, rose again, and there among it all was my little 30-year lifespan — part of the same history yet startlingly small. Heaven’s Vault is an attempt to answer that question. It’s a game about history, but also a game in which, to paraphrase William Faulkner, the past is never truly past. You play Aliya, a cocky young adventurer exploring different planets in a run-down nebula. Your patron is the university on Iox: a rich world where people don’t really believe in history and consider your trade beneath the “useful” sciences. But when a friend of your mentor goes missing in pursuit of buried secrets, you are sent out to follow his trail and figure out just what he discovered. Happily, this doesn’t involve traditional tomb-raiding stressors like leaping over spike pits or shooting tigers. Aliya doesn’t carry any weapons, and Heaven’s Vault is a cool, meditative experience. You sail to different moons, walk around their ruins and marketplaces, examine objects, and have branching conversations with NPCs. That includes your somewhat sarky robot minder, Six. Ingold says Inkle wanted to “reinvent the 3D adventure game” without all the progress gates, so the players don’t get stuck or need to backtrack. Instead of endless mandatory riddles, there is one giant, interconnected puzzle: an ancient language, the meaning of which must be pieced together slowly using inscriptions scattered across the nebula. Guessing these words, and changing those guesses as you find new evidence, is one of the game’s central mechanics — as well as its most unusual. For example, one demo I played involved exploring an old stone complex filled with verdant plant life. There was an inscription on the wall that the player can choose to translate as either “Garden” or “Temple.” Whichever you pick, Aliya and Six’s dialogue will reflect your choice, and much of what they see will be interpreted in that light. I decided it was a graveyard, but you might decide it was a monastery. As I played, Ingold and his co-founder Joseph Humfrey, Inkle’s art and code director, kept asking me to explain my thought process. They clearly delighted in how different people approached the same symbols. 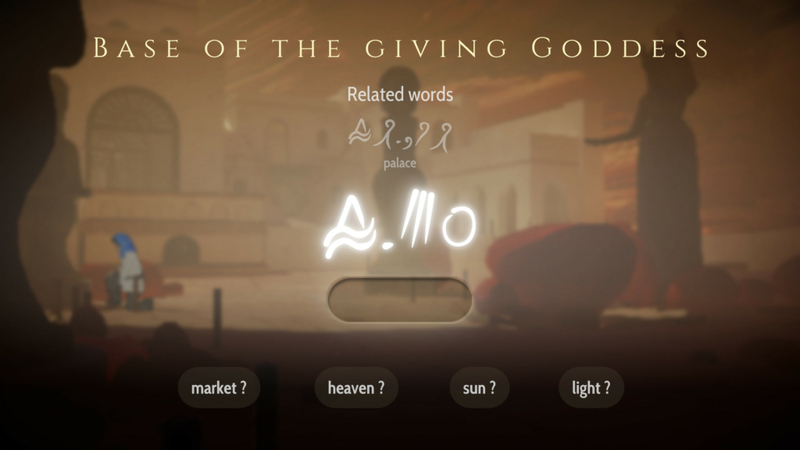 In another demo, earlier in the game, I guessed that an inscription on an artifact meant “God’s pilgrims pray,” because one of the letters in the first word also appeared in “Holy” and “Goddess.” Later, however, another sentence made it clear I was wrong. I instead concluded that the letter in question meant “person” (perhaps a goddess is a type of person? ), and that the word I mis-translated was “we.” Ingold says the language is built like German, so that each word is built from combinations of smaller words. Solving a sentence in one location might unlock the meaning of another many worlds away — a complex web of language, driven by the same conversation and state-tracking system that powered 80 Days. When I suggested that Heaven’s Vault might actually be the anti-Witness, Ingold and Humfrey enthusiastically agreed. “I’m the biggest Witness fan on the team, so we definitely have some strong influences,” Humfrey explained. “But at the same time there’s a big separation in The Witness between what you are looking at and what you’re actually doing.” In Thekla’s game, as well as in Heaven’s Vault, the player examines the environment outside each puzzle for clues to solve the puzzle. But there are clear differences between things you can operate and things you cannot. Here, everything flows together: clue, puzzle, player, world. As such, Heaven’s Vault has a lot of room for players to be “wrong.” You can reach the end with many different translations and theories about its central mysteries. You can give NPCs many different explanations of what you think happened in the past. The game is designed to respond to those choices, respect them, and flow onwards instead of rejecting them and resetting your progress. Humfrey compared the different translations you can settle on to the different routes you can take through a level in Deus Ex. That is also how Heaven’s Vault tries to avoid a common pitfall (or at least a common risk) of environmental storytelling. Back in the dawn of walking simulators, before that term was even coined and reclaimed, game designer Robert Yang criticized the genre for so often putting the actual plot in the past — before the player arrived. There’s still some truth to that: think of Everybody’s Gone To The Rapture or Return of the Obra Dinn. Both ask you to probe only the aftermath of strange events. Here, Ingold and Humfrey say they want every discovery from the past to have weight in the present — that Heaven’s Vault is really about the political significance of what you dig up, as well as how your mentor, colleagues, and detractors react to it. 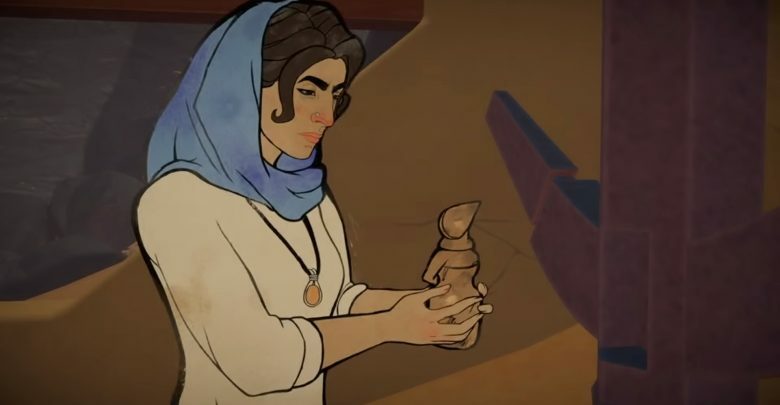 Inkle was inspired by the work of Egyptian archaeologist Monica Hanna, who has spent years since the Arab Spring trying to prevent tomb raiding by convincing Egyptians that their heritage belongs to all of them — not just to the state. The sections I played through bear that out. For starters, not all the places you visit are abandoned ruins: some are active settlements, such as a soggy farming village where nobody will talk to you because of the very active and ongoing oppression they endure under Iox rule. On top of that, you are always digging through multiple layers of history at once. The ancient history of the nebula is muddied and obscured by the more recent footprints of Renba, the man you’re tracking down. Most of all, it was clear to me within a couple of hours’ play that the questions I pursued were the subject of ongoing power games — maybe even of conspiracies — and had the potential to change the future. At least one artifact I found was of such immense and obvious significance that I considered hiding it from my mentor. Indeed, concealing your discoveries from NPCs seems like an important recurring choice. It ties into a relationship system that tracks how and what different NPCs know and feel about you. “You can get to a point where nobody really trusts each other,” Ingold warned. 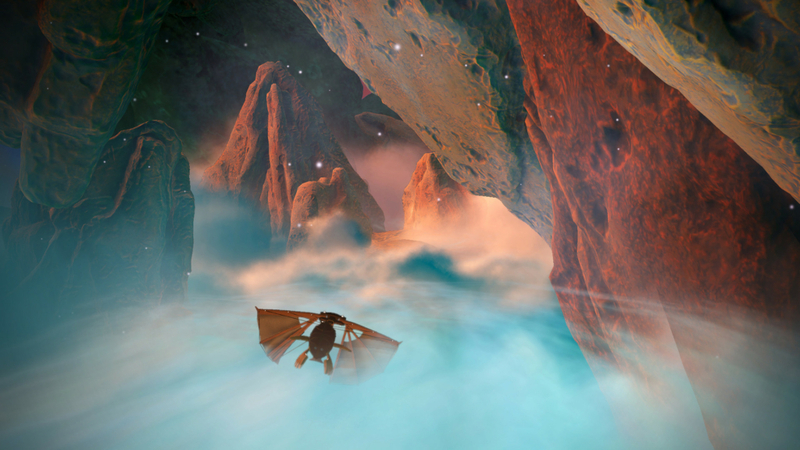 Inkle hopes that Heaven’s Vault will provide a template for future games that combine 3D environments with interactive text. The most important thing, as far as the devs are concerned, is that their experiment be replicable by other small teams. 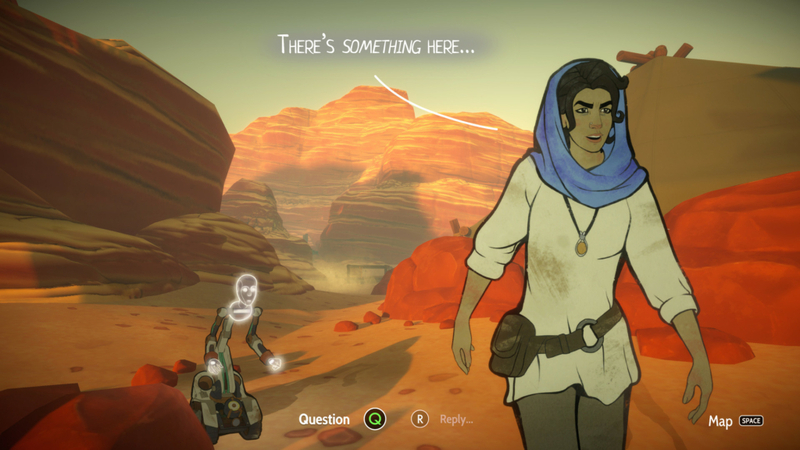 Inkle has only eight employees, and Heaven’s Vault reflects that. Its animation system, for instance, is very stripped down. Aliya herself is depicted by line drawings which fade into each other at only a few frames per second. 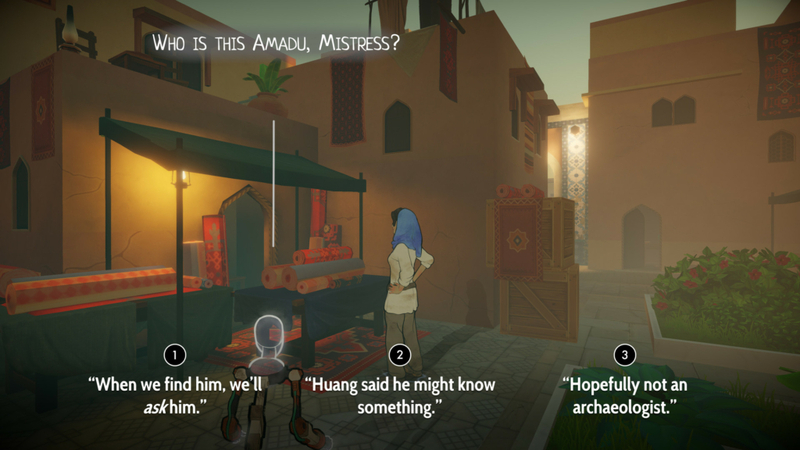 That allowed Inkle to create a third-person 3D game — with controls not so different from Tomb Raider or Uncharted, but without the enormous and ever-increasing expense of motion capture and, say, fine eyelash rendering. Ingold speculated about using the same engine to build a Downton Abbey analogue or a spy drama. In the meantime, Heaven’s Vault is fascinating. It is chugs a little on my low-end machine, and the camera is a bit fidgety. Sometimes the animation skips a few frames. But it is pretty, as well as melancholy, heartfelt, and not quite like anything else I’ve played. It has a diverse cast and writing that I would actually be proud, rather than embarrassed, to have a non-gaming friend read or hear over my shoulder. I’m also comforted by a solemn promise that Ingold made to me about the plot.